Experimentation | "blackberry-eating in late September"
N. and I rarely finish an entire loaf of bread. Oh we try, but invariably those loaves of whole wheat, and sliced sourdough, and the occasional rye, end up shoved to the back of the freezer or refrigerator with only a slice or two left in them. Then they just sit there. For months, sometimes. The same, as of late, is true of bagels. In spurts of enthusiasm toward the noble meal that is breakfast, we buy half-dozens and dozens of bagels from various bakeries and munch our way through four or five before the lonely outcast remainder is slowly pushed behind Tupperware containers and plastic-wrapped leftovers. Well no more. 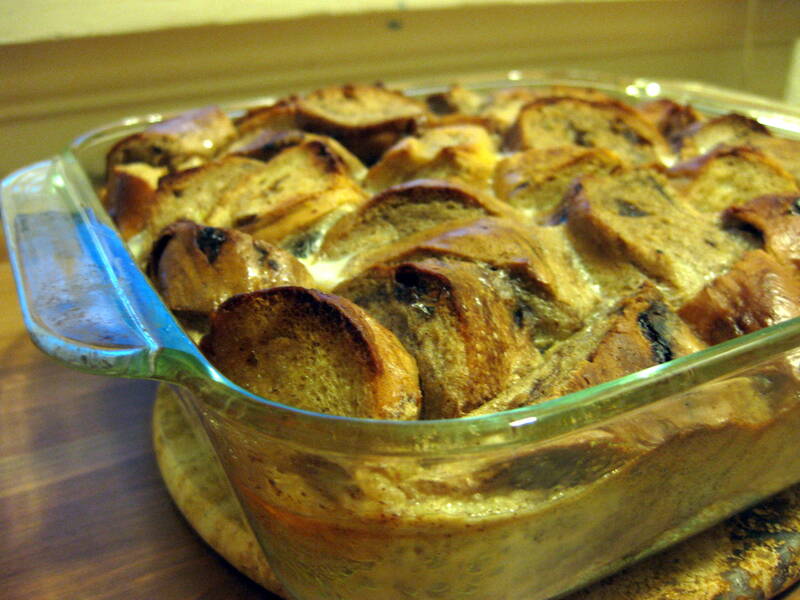 I have been meaning to make bread pudding for some time now, in an effort to put to use the heels and scraps of bread that litter our freezer shelves, but I couldn’t find a recipe I liked and, in one of my odd and unfounded deductions, had somehow decided it was a difficult thing to make. 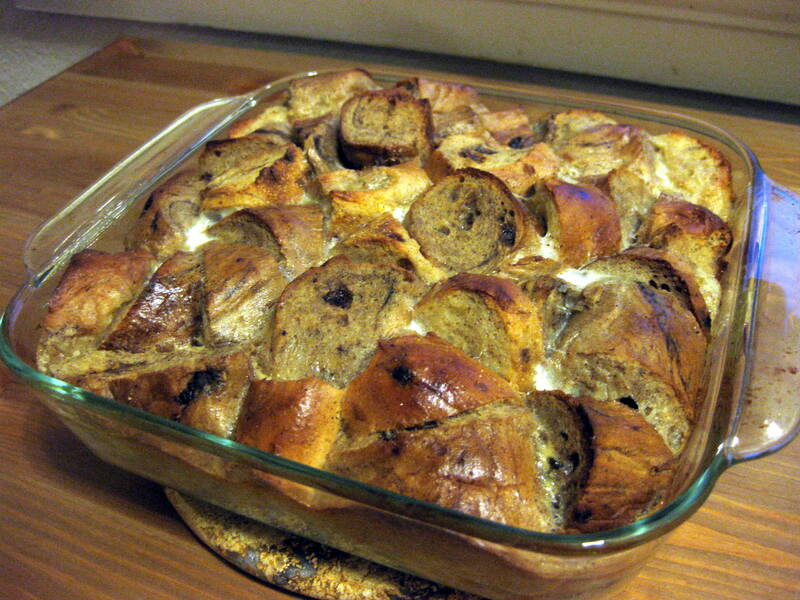 Yesterday, with no experience and only a handful of recipe ideas from the internet (google: “bagel bread pudding”; you’ll be surprised by the number of people who have tried it! ), I liberated our stash of lonely, forgotten, individually bagged cinnamon raisin bagels and invited them to a custard party. ½ – 1 cup sugar, depending on how sweet you want it. I wanted dessert AND breakfast, so I only added about ½ cup. Tear or cut the bagels into bite-sized chunks (or a little bigger), and settle them in a single layer in a square glass baking dish (8×8 or 9×9). In a medium bowl, mix all remaining ingredients together and whisk well to blend. This is the custard. Pour custard mixture over the bagel pieces, top with a plate or pan (something to push the bagel pieces down into the custard), and refrigerate for at least an hour. After at least an hour of chilling under pressure, move the pan to a preheated 350F oven and bake for around 45 minutes, or until the tops of the bagel pieces are browned and slightly crisp. Thanks to the cinnamon, the pumpkin pie spice, and the rum, after about twenty minutes our house filled with that holiday-season smell. You know what I mean. After 45 minutes, I peeked in the oven and saw that the top pieces, the edges that poked out over the custard, were dark brown and crispy, and when I touched them lightly the whole beautiful pudding jiggled slightly and then sprang back into shape after my touch. The top had puffed up as the eggs cooked and expanded, and when I took it out of the oven I could hear it hissing and whining softly as air released. This entry was posted in Baking, bread, breakfast, Dairy, Desserts, eggs, vegetarian by Chelsea. Bookmark the permalink.